Japanese sports car fans, this is the comparison you must been waiting for ever since the specs of Mazda’s latest MX-5 were announced. 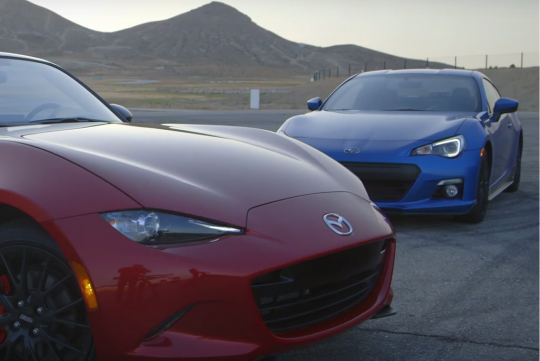 In this episode of MotorTrend's Head2Head video comparison, the new ND generation Mazda MX-5 is pitted against Subaru's mighty BRZ. With more than 150bhp vs the BRZ's 197bhp power output, you might think that the new MX-5 will not be a match against the BRZ. But with its lighter weight, one should not discount the MX-5 that easily. Watch the video and find out which of the cars is the better Japanese RWD sports car in the market today.